Pasta isn’t something most people associate with Greece, but pasta was actually introduced to the Greeks by the Italians centuries ago and they’ve been enjoying it ever since (although it’s not as much of a staple food in Greece as it is in Italy). Two of the most popular types of pasta in Greece are orzo (a rice-shaped pasta) and macaroni, and either of these types of pasta would work well with this dish, but we had some penne on hand, so we used that. There are a number of things we really love about this dish. Firstly, it’s very easy to make. The spinach and cherry tomatoes are cooked by simply adding them to the boiling pasta water for the last couple of minutes of cooking, and we add the canned beans to heat through in the pasta water too. Then it’s just a matter of draining all the cooked ingredients and mixing them with the olives, walnuts and a simple sauce mixture, and topping with crumbled feta. So this dish comes together, including prep and cooking time, in only around 25 minutes. But the results far outweighed the effort we put in. Not only is it wonderfully colorful, the robust flavors of the Kalamata olives and feta are really nicely counterbalanced by the sweet cherry tomatoes and delicately flavored white beans. And the walnuts add a perfect contrasting crunch. 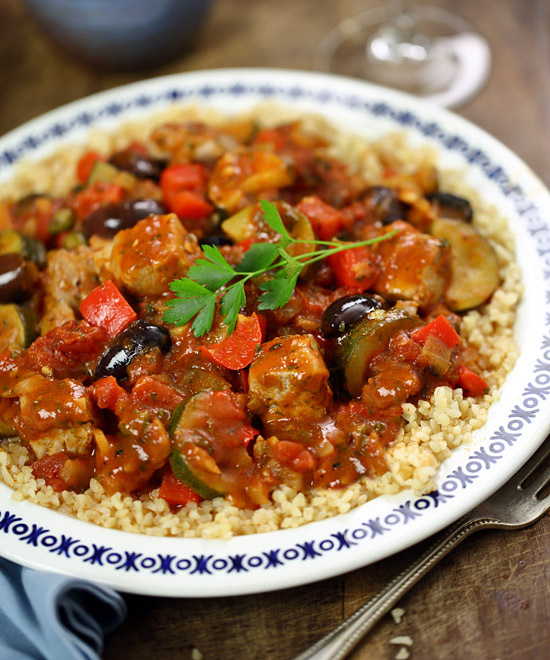 And this dish isn’t just flavor-packed, it’s also nutrient-packed. The white beans are a good source of protein, slow-releasing carbs and dietary fiber. The walnuts also contain protein and fiber and are a good source of heart-healthy omega-3 fatty acids. The spinach is rich in antioxidants, and the tomatoes are a good source of lycopene, a special type of phytochemical with anti-cancer properties. But we weren’t thinking of any of that when we were scoffing down this dish — we were too busy being transported to Greece! 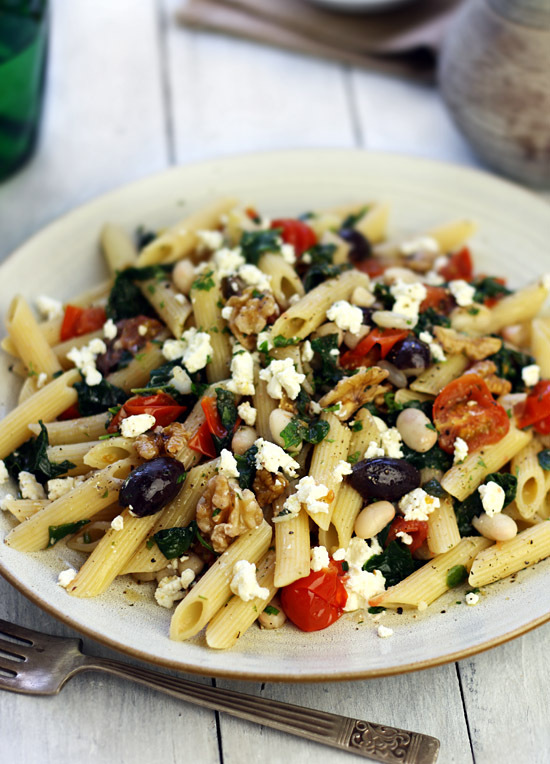 A Greek-inspired pasta dish with white beans, walnuts, Kalamata olives, cherry tomatoes and spinach, topped with crumbled feta cheese. COOK the pasta in a large pot of boiling water according to package directions, adding the white beans, spinach and tomatoes in the final 2 minutes of cooking (making sure to bring the water back to a boil before timing the last 2 minutes). WHILE the pasta cooks, mix together the olive oil, lemon juice, garlic, salt, pepper and parsley in a small bowl. DRAIN the pasta, beans and vegetables, reserving 2 tablespoons of the pasta cooking water in bottom of the pot. 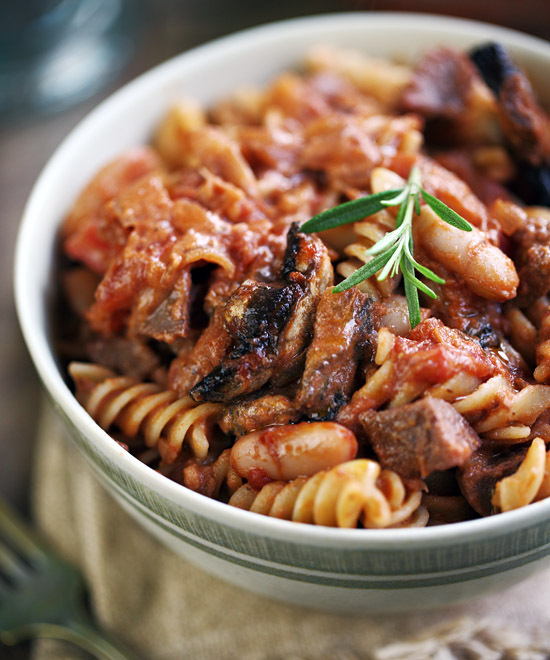 RETURN the pasta, beans and vegetables to the pot with the dressing and toss gently to mix well. ADD the walnuts and olives and toss together until combined. 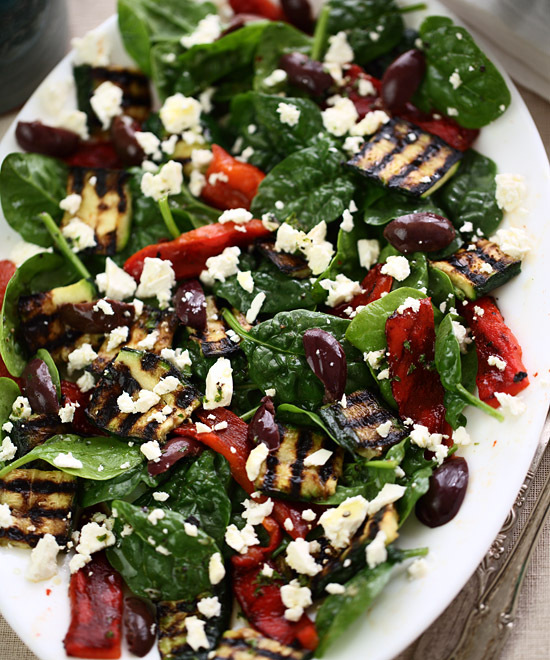 SERVE with the crumbled feta on top.